This 100% All Natural Organic Vitamin Supplement contains all the wonderful properties of true Norwegian Kelp. Packaged and quality controlled by a U. S. Pharmaceutical-Grade Facility (under FDA inspection) as an added guarantee of assurance and safety. Our New Norwegian Kelp Capsules are made with a Vegan/Vegetarian friendly Capsule and do not contain colors, flavors, or preservatives! 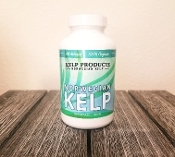 supplementing the diets of their pets, their livestock, and their own families… try our Norwegian Kelp Nutritional Supplement and find out why! Each bottle contains 200 capsules with a 2/daily recommended dosage.